A diagram of the photovoltaic circuit. Department of Materials Science and Engineering (MSE) graduate student Parag Banerjee, advised by Professor Gary Rubloff (MSE, Institute for Systems Research and Director, Maryland NanoCenter) is the first author of a paper describing a nanoscale photovoltaic (solar-powered) circuit that could be used to power a wide range of optical and electronic devices. The circuit could also be adapted for data storage, replacing the traditional binary system ("ones and zeros") with one in which data corresponds to different wavelengths of light. Banerjee led the experimental effort as part of a two-month, on site internship with Professor Dawn Bonnell's research group at the University of Pennsylvania's Nano/Bio Interface Center. It is one of the first demonstrations of light-powered electrical circuits that generate their own energy rather than relying on batteries or solar cells to function. By attaching single molecules similar to those used by plants for photosynthesis to an array of gold nanoparticles, Banerjee and his colleagues have been able to direct light and make the molecules change their electrical properties. "When light falls on gold nanoparticles, it is captured and refocused to regions in between them," Banerjee explains. "The refocused light is of very high intensity and is a result of the free electrons, already present in metals, oscillating at the surface of the nanoparticles. If we can attach a molecule between two gold nanoparticles that can give up its electrons easily when hit with the light, it's possible to produce a current in the circuit without the need to use solar cells as means to first convert light into electricity." "The neat thing about this discovery," Banerjee adds, "is that in the future it could change the way we power our devices. Imagine a desktop computer enclosed in a clear case. It has no power cord and the room light is sufficient to make it run." At present, the energy generated by the circuits is not sufficient to power a device such as a computer or iPod. Banerjee's collaborators are working on ways to scale up the technology to produce a one amp, one volt circuit that is an inch long and the width of a human hair. "The demonstration of the phenomenon, as described in our paper, is only the first step," says Banerjee. "In order to make these circuits feasible, we need to determine how to control the distance between the gold nanoparticles to enable the control of the wavelength of focused light, and we also need to design newer molecules that, when attached to the nanoparticles, maximize the production of electrons when exposed to light." 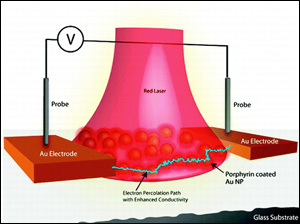 The paper, titled "Plasmon-Induced Electrical Conduction in Molecular Devices," appears in ACS Nano, 2010, 4(2). It has already received media attention from Popular Science, Discovery.com, and Science Daily. Banerjee's internship was funded by his John and Maureen Hendricks Energy Research Fellowship (awarded by the University of Maryland Energy Research Center) and his Future Faculty Fellowship (awarded by the A. James Clark School of Engineering). The solar-powered circuit research is funded by the National Science Foundation and the U.S. Department of Energy. "Imagine a desktop computer enclosed in a clear case. It has no power cord and the room light is sufficient to make it run." Graduate student Parag Banerjee, Department of Materials Science and Engineering, A. James Clark School of Engineering.